According to the interpretation of Moses ibn Ḥabib, a proper name, which was adopted as a family name by Spanish-Portuguese Jews. It frequently occurs in connection with "Paz," "Shalom," and "Henriquez." Families bearing this name were living in the seventeenth century in Bayonne, London, Amsterdam, and Hamburg; and others which have adopted it still exist in Turkey. Son of Abraham Shalom Moreno; the latter died at Bayonne in 1684 and was called also Luis de Paz. David was celebrated for his wisdom and Talmudic learning. Member of the Academia de los Floridos, founded in Amsterdam 1685. Physician in Amsterdam; died there June 21, 1667. In Oct., 1663, he gave his approbation to the little book "Orthographia Castellana" by Abraham da Fonseca. His grave is marked by a noble monument, upon which is a coat of arms consisting of a helmet surmounted by a count's coronet. Lived in Amsterdam; mentioned as the writer of a sonnet. 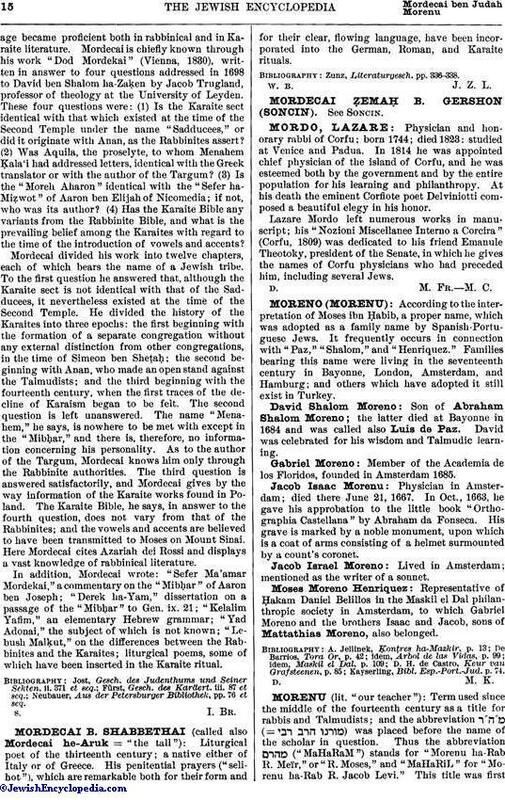 Representative of Ḥakam Daniel Belillos in the Maskil el Dal philanthropic society in Amsterdam, to which Gabriel Moreno and the brothers Isaac and Jacob, sons of Mattathias Moreno, also belonged. Kayserling, Bibl. Esp.-Port.-Jud. p. 74.